The Malvern Hills has always been a popular haunt for birdwatchers and offers a diverse range of birdlife not often encountered elsewhere in the county, with perhaps the exception of Bredon Hill. The spring and particularly the autumn periods are the most rewarding times to visit and the areas around North Hill and Worcestershire Beacon tend to produce the most interesting species. This autumn proved to be one of the best recorded in recent years, with good numbers of Ring Ouzel, a fine selection of finches and the odd local rarity thrown in. 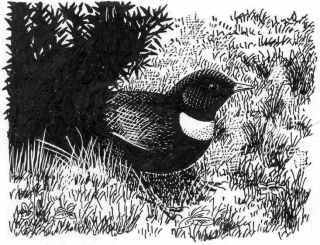 An impressive passage of Ring Ouzel was recorded this autumn, exclusively around North Hill and Worcestershire Beacon, with birds observed from the middle of September, through to the beginning of November. The first was a single on September 14th, followed by another on 22nd, then three on 24th. Totals increased dramatically during October, commencing with singles on 3rd, 6th and 17th, but the largest passage period was recorded between the 19th and 23rd. Most the birds counted were observed flying in high from the west, persistent calling betraying their presence as they dropped down into the valleys. 21 birds were noted on 19th and included a single flock of 14; 20 were present the next day, many of which were new arrivals; then 18 on 21st, 11 on 22nd and 10 on 23rd. Numbers then began to dwindle with one on 25th, five on 26th, singles on 29th and 30th, eight on November 2nd and finally two on 3rd. This strong passage of Ring Ouzels coincided with large numbers arriving along the north/east of the country and would suggest our birds had originated from Scandinavia. A reasonable movement of finches also passed over the hills, the majority of records coming from the Happy/Green Valley area. Species encountered included small numbers of Siskin, Lesser Redpoll and Brambling, the best count of the later being 26 on October 26th and larger counts of Chaffinch, included 30 on October 8th, 60 on the 26th and 107 on 27th. Crossbill was also regularly encountered, with six noted on September 26th, two on October 19th and 26th, one on November 11th and up to a dozen on 7th. A Hawfinch was recorded on October 27th and a single Twite flew over calling on November 5th. Winter thrushes were late to arrive this autumn in any numbers. A single Redwing was noted on September 28th, but small flocks weren’t recorded until the middle of October and the first Fieldfare didn’t arrive until October 21st. A late Wheatear frequented the Top of North Hill on October 19th and 20th and a strong passage of Wood Pigeon was recorded on October 23rd, with a count of 10,000 in just one hour, and another 2,300 passed over on 26th within an hour. The hills also held a few local rarities, starting with a 1st winter plumaged Dotterel on Table Hill on September 24th, a Wood Lark on Sugarloaf Hill on October 20th, a Rock Pipit over North Hill on October 21st and Short-eared Owl around Worcestershire Beacon on October 27th. Black Redstart and Firecrest were in Chat Valley on November 5th, two 1st winter male Dartford Warblers in North Valley from November 7th to 13th and two Snow Buntings on North Hill/Table Hill and a Black Redstart at Westminster Bank in Malvern on November 13th.